Yesterday I planned to enter the 7 pm Railbirds.com ranking event on LuvinPoker.com. To that end, I took a nap just before the tourney to assure that I would be at my best. Of course, I had failed to let Diane know of my plans so when I woke up 30 minutes prior to the event, she thought I was being quite helpful in getting dinner ready. I started to prepare the sweet potatoes while she pan fried the pork chops. I did not have much time before the event, so I wanted to speed dinner up. With the potato in the microwave, I then warmed up our soup appetizer and served it. We ate the soup and by that time I had told Diane about the tourney. After we finished the soup, I got online and quickly registered for the tourney. I hastily cut up my pork chop into bit size pieces and prepared the sweet potato for easy eating. I sat down on the couch with my meal and my laptop just as the tournament started. My first two hands were easy folds. My third hand was a pair of Kings. When it was my turn to bet, I raised to $30, which was three times the big blind. I got two callers. The flop was 5 6 10. When it was my turn to bet, I lead out with bet of $65, about 2/3 of the current pot. The two players called and the turn was a 7. Not a good flop for Kings. The pot now had about $280 and I bet out again with $160 and this time I got one caller. The river card was an eight, a terrible card because this could complete a straight for my opponent if he already did not have one. I checked, he raised and I folded. I know my opponent and he does not bluff much, so I saved the rest of my chips for later. My next two hands were uneventful except that I was dealt a 4 7 off suit one hand and a 7 4 off suit the next. Then I was dealt a pair of pocket Aces, AA. There were two players ahead of me that called the minimum bet of $10. When it was my turn, I bet out $40 or four times the big blind, hoping to get only one caller. But the two players that had limped in quickly called my bet. The flop was 4 5 6 offsuit. This was not a good flop. The two players ahead of me checked. I thought it over and decided that the board looked two scary to allow either of theses players to stay in the hand and catch up to my pair of Aces. I decided to go all in and force them to fold. Well that worked for the first limper. But as always is the case, when you get called in these situations, it is usually by somebody with a better hand. My opponent turned over 7 8, showing a straight on the flop. My only hope was for either of the two remaining Aces to hit the turn and the river or for an Ace and a card paring the board to give me a full house. Otherwise I would be out of the tournament. No miracle cards hit and I was out. Just like that. I had lost 40% of my starting stack with KK and the rest with AA. I did not feel too badly about my play. At least I made decisions that I felt gave me the best chances based on what I thought my opponent had. I was wrong, but I could accept what had happened and not let it bother me. In less than 10 minutes from the start of the tournament, I was out. And I was not going to reward myself with dessert. Do you play with a plan for every hand? Do have ideas on what you will do pre-flop, flop, turn and river? Do you also take into consideration your position at the time? In many of my previous posts, I discuss how important it is to try making the best decisions possible in playing each hand of poker. What I may not have mentioned is that you also need to be able to emotionally detach yourself from the hands being played and playing optimally. Sadly emotions still gets in the way of my play. Last night I was in another RailBirds.com ranking tournament. I played most hands as optimally as possible. I folded marginal or speculative hands in early position, pre-flop. I played top ranked hands strongly (AA, KK, QQ). However, when I got AK and opened with a raise, I got re-raised. Well, the optimal play with AK in this position is to either fold or re-raise again about the size of the pot. If my opponent re-raised again, I should assume they have a great hand and I should fold. But my emotions kicked in and my poker logic and skills went out the window. I re-raised all-in and I was instantly called. My opponent had KK and my AK did not improve and I was out of the tourney in 28th place. So my emotional play gets in the way of my optimal tournament play at times. This does not always happen. But it does, and I have to work on that aspect of my game. On the bright side, I entered a private Omaha Pot Limit tourney about two hours later and came in third place out of 22 players. Only the top three players were paid. I did not stray in that game from my optimal play. Still, Omaha is a game that I am still learning. Are you able to separate your emotions from your poker decisions? Do other players put you on tilt? Are you able to rebound when you make a bad decision? 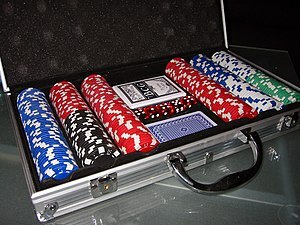 Before Black Friday, which was when the DOJ shut off access to PokerStars.com, FullTiltPoker.com and UB.com, I used to play micro stakes cash games like No Limit Holdem or Pot Limit Ohama, etc. Some of the time that I played in events sponsored by the Twitter Poker Tour (no longer active, sadly) or by RailBirds.com. The good news for me is that RailBirds.com found a poker site that was still accepting US players, LuvinPoker.com. While making deposits is somewhat difficult for me, I joined so that I could still play poker with some of my RailBird friends. Over the last six years I have played in probably a hundred events involving the Railbirds. I have cashed in a few, meaning that I won some money back but I had never won first place in a Railbird ranking event. A ranking event is one that Railbirds.com run and keeps score of each of the top scorers in the event. At the end of the month, the top ranking player is announced and sometimes a prize is given as well. Well I have finally done it. I have come in first place in a Railbirds.com ranking event. I attribrute the win as the result of making good decisions. And I attribute the good decisions to a poker book I am currently reading,“Decide to Play Great Poker”, written by Annie Duke and John Vorhaus. I am only a third of the way into the book, but it was enough to get me on the right track. When I have completed the book (which was an Anniversary gift from my wife, Diane), I intent to review it. Do you decide to play great poker? How did that work out for you? Is it hard to stick to a plan? I am going to see if I can grind a little income playing Limit Poker at The Poker Room NH located in Hampton Falls NH just across the Seabrook NH town line on US Route 1. I might accomplish this if I stick to a schedule of playing set hours. Perhaps from 3 pm Monday through Friday, leaving the weekends free for family events. I think in time I would learn how most of the regulars play and that would help me make better decisions at the table. For the most part, I intend to play Limit Hold’em at the $2/4 tables. Post note: I drafted this on June 19th. I tried out the limit games and lost over $150.oo total. Grinding they call it and grinding it is, In fact, this it is called being ground down. I might try it again in mid July. Wait. I only have 3 more days to wait. Have you ever made plans and have them go differently than you planned? How did you handle it? Did you make new plans?